Managing system resources on Red Hat Enterprise Linux 6. Red Hat Enterprise Linux 6 provides a new kernel feature: control groups, which are called by their shorter name cgroups in this guide. Cgroups allow you to allocate resources — such as CPU time, system memory, network bandwidth, or combinations of these resources — among user-defined groups of tasks (processes) running on a system. You can monitor the cgroups you configure, deny cgroups access to certain resources, and even reconfigure your cgroups dynamically on a running system. The cgconfig (control group config) service can be configured to start up at boot time and reestablish your predefined cgroups, thus making them persistent across reboots. By using cgroups, system administrators gain fine-grained control over allocating, prioritizing, denying, managing, and monitoring system resources. Hardware resources can be appropriately divided up among tasks and users, increasing overall efficiency. Cgroups are organized hierarchically, like processes, and child cgroups inherit some of the attributes of their parents. However, there are differences between the two models. All processes on a Linux system are child processes of a common parent: the init process, which is executed by the kernel at boot time and starts other processes (which may in turn start child processes of their own). Because all processes descend from a single parent, the Linux process model is a single hierarchy, or tree. Additionally, every Linux process except init inherits the environment (such as the PATH variable) and certain other attributes (such as open file descriptors) of its parent process. child cgroups inherit certain attributes from their parent cgroup. The fundamental difference is that many different hierarchies of cgroups can exist simultaneously on a system. If the Linux process model is a single tree of processes, then the cgroup model is one or more separate, unconnected trees of tasks (i.e. processes). Multiple separate hierarchies of cgroups are necessary because each hierarchy is attached to one or more subsystems. A subsystem represents a single resource, such as CPU time or memory. Red Hat Enterprise Linux 6 provides ten cgroup subsystems, listed below by name and function. net_cls — this subsystem tags network packets with a class identifier (classid) that allows the Linux traffic controller (tc) to identify packets originating from a particular cgroup task. net_prio — this subsystem provides a way to dynamically set the priority of network traffic per network interface. ns — the namespace subsystem. perf_event — this subsystem identifies cgroup membership of tasks and can be used for performance analysis. You may come across the term resource controller or simply controller in cgroup literature such as the man pages or kernel documentation. Both of these terms are synonymous with “subsystem” and arise from the fact that a subsystem typically schedules a resource or applies a limit to the cgroups in the hierarchy it is attached to. The definition of a subsystem (resource controller) is quite general: it is something that acts upon a group of tasks, i.e. processes. Remember that system processes are called tasks in cgroup terminology. Here are a few simple rules governing the relationships between subsystems, hierarchies of cgroups, and tasks, along with explanations of the consequences of those rules. A single hierarchy can have one or more subsystems attached to it. As a consequence, the cpu and memory subsystems (or any number of subsystems) can be attached to a single hierarchy, as long as each one is not attached to any other hierarchy which has any other subsystems attached to it already (see Rule 2). Any single subsystem (such as cpu) cannot be attached to more than one hierarchy if one of those hierarchies has a different subsystem attached to it already. 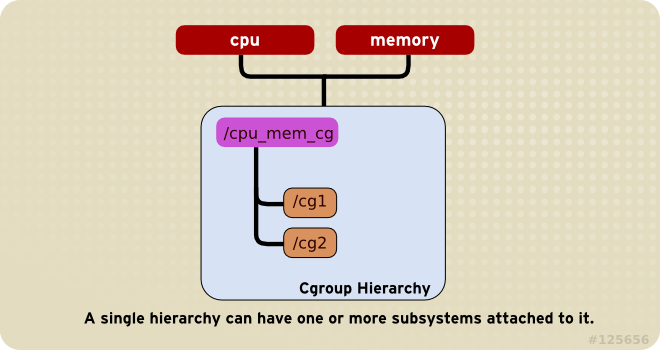 As a consequence, the cpu subsystem can never be attached to two different hierarchies if one of those hierarchies already has the memory subsystem attached to it. However, a single subsystem can be attached to two hierarchies if both of those hierarchies have only that subsystem attached. Figure 1.2. Rule 2—The numbered bullets represent a time sequence in which the subsystems are attached. Each time a new hierarchy is created on the systems, all tasks on the system are initially members of the default cgroup of that hierarchy, which is known as the root cgroup. For any single hierarchy you create, each task on the system can be a member of exactly one cgroup in that hierarchy. A single task may be in multiple cgroups, as long as each of those cgroups is in a different hierarchy. As soon as a task becomes a member of a second cgroup in the same hierarchy, it is removed from the first cgroup in that hierarchy. At no time is a task ever in two different cgroups in the same hierarchy. As a consequence, if the cpu and memory subsystems are attached to a hierarchy named cpu_mem_cg, and the net_cls subsystem is attached to a hierarchy named net, then a running httpd process could be a member of any one cgroup in cpu_mem_cg, and any one cgroup in net. The cgroup in cpu_mem_cg that the httpd process is a member of might restrict its CPU time to half of that allotted to other processes, and limit its memory usage to a maximum of 1024 MB. Additionally, the cgroup in net that the httpd process is a member of might limit its transmission rate to 30 MB/s (megabytes per second). When the first hierarchy is created, every task on the system is a member of at least one cgroup: the root cgroup. When using cgroups, therefore, every system task is always in at least one cgroup. Any process (task) on the system which forks itself creates a child task. 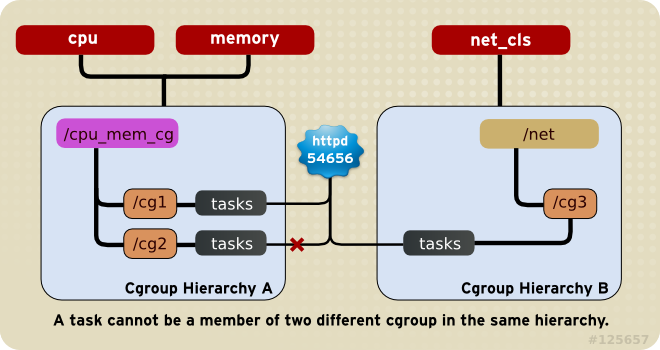 A child task automatically inherits the cgroup membership of its parent but can be moved to different cgroups as needed. Once forked, the parent and child processes are completely independent. As a consequence, consider the httpd task that is a member of the cgroup named half_cpu_1gb_max in the cpu_and_mem hierarchy, and a member of the cgroup trans_rate_30 in the net hierarchy. When that httpd process forks itself, its child process automatically becomes a member of the half_cpu_1gb_max cgroup, and the trans_rate_30 cgroup. It inherits the exact same cgroups its parent task belongs to. From that point forward, the parent and child tasks are completely independent of each other: changing the cgroups that one task belongs to does not affect the other. Neither will changing cgroups of a parent task affect any of its grandchildren in any way. To summarize: any child task always initially inherits memberships to the exact same cgroups as their parent task, but those memberships can be changed or removed later. Figure 1.4. Rule 4—The numbered bullets represent a time sequence in which the task forks. Because a task can belong to only a single cgroup in any one hierarchy, there is only one way that a task can be limited or affected by any single subsystem. This is logical: a feature, not a limitation. You can group several subsystems together so that they affect all tasks in a single hierarchy. Because cgroups in that hierarchy have different parameters set, those tasks will be affected differently. It may sometimes be necessary to refactor a hierarchy. An example would be removing a subsystem from a hierarchy that has several subsystems attached, and attaching it to a new, separate hierarchy. Conversely, if the need for splitting subsystems among separate hierarchies is reduced, you can remove a hierarchy and attach its subsystems to an existing one. The design allows for simple cgroup usage, such as setting a few parameters for specific tasks in a single hierarchy, such as one with just the cpu and memory subsystems attached. The design also allows for highly specific configuration: each task (process) on a system could be a member of each hierarchy, each of which has a single attached subsystem. Such a configuration would give the system administrator absolute control over all parameters for every single task. The parent process is able to alter the environment before passing it to a child process. You should be aware that subsystems are also called resource controllers, or simply controllers, in the libcgroup man pages and other documentation. As explained in Chapter 3, Subsystems and Tunable Parameters, control groups and the subsystems to which they relate can be manipulated using shell commands and utilities. However, the easiest way to work with cgroups is to install the libcgroup package, which contains a number of cgroup-related command line utilities and their associated man pages. It is possible to mount hierarchies and set cgroup parameters (non-persistently) using shell commands and utilities available on any system. However, using the libcgroup-provided utilities simplifies the process and extends your capabilities. Therefore, this guide focuses on libcgroup commands throughout. In most cases, we have included the equivalent shell commands to help describe the underlying mechanism. However, we recommend that you use the libcgroup commands wherever practical. The cgconfig service installed with the libcgroup package provides a convenient way to create hierarchies, attach subsystems to hierarchies, and manage cgroups within those hierarchies. It is recommended that you use cgconfig to manage hierarchies and cgroups on your system. The cgconfig service is not started by default on Red Hat Enterprise Linux 6. When you start the service with chkconfig, it reads the cgroup configuration file — /etc/cgconfig.conf. Cgroups are therefore recreated from session to session and remain persistent. Depending on the contents of the configuration file, cgconfig can create hierarchies, mount necessary file systems, create cgroups, and set subsystem parameters for each group. The default /etc/cgconfig.conf file installed with the libcgroup package creates and mounts an individual hierarchy for each subsystem, and attaches the subsystems to these hierarchies. The cgconfig service also allows to create configuration files in the /etc/cgconfig.d/ directory and to invoke them from /etc/cgconfig.conf. If you stop the cgconfig service (with the service cgconfig stop command), it unmounts all the hierarchies that it mounted. The subsystems listed in the above configuration are automatically mounted to their respective hierarchies under the /cgroup/ directory. It is recommended to use these default hierarchies for specifying control groups. However, in certain cases you may need to create hierarchies manually, for example when they were deleted before, or it is beneficial to have a single hierarchy for multiple subsystems (as in Section 4.3, “Per-group Division of CPU and Memory Resources”). Note that multiple subsystems can be mounted to a single hierarchy, but each subsystem can be mounted only once. See Example 2.1, “Creating a mount entry” for an example of creating a hierarchy. Since each subsystem can be mounted only once, the above commands would fail if cpuset is already mounted. When you install the libcgroup package, a sample configuration file is written to /etc/cgconfig.conf. The hash symbols ('#') at the start of each line comment that line out and make it invisible to the cgconfig service. The /etc/cgconfig.d/ directory is reserved for storing configuration files for specific applications and use cases. These files should be created with the .conf suffix and adhere to the same syntax rules as /etc/cgconfig.conf. The cgconfig service first parses the /etc/cgconfig.conf file and then continues with files in the /etc/cgconfig.d/ directory. Note that the order of file parsing is not defined, because it does not make a difference provided that each configuration file is unique. Therefore, do not define the same group or template in multiple configuration files, otherwise they would interfere with each other. Storing specific configuration files in a separate directory makes them easily reusable. If an application is shipped with a dedicated configuration file, you can easily set up cgroups for the application just by copying its configuration file to /etc/cgconfig.d/. The following instructions, which cover creating a new hierarchy and attaching subsystems to it, assume that cgroups are not already configured on your system. In this case, these instructions will not affect the operation of the system. Changing the tunable parameters in a cgroup with tasks, however, can immediately affect those tasks. This guide alerts you the first time it illustrates changing a tunable cgroup parameter that can affect one or more tasks. On a system on which cgroups are already configured (either manually, or by the cgconfig service) these commands fail unless you first unmount existing hierarchies, which affects the operation of the system. Do not experiment with these instructions on production systems. When cgconfig next starts, it will create the hierarchy and attach the subsystems to it. The following example creates a hierarchy called cpu_and_mem and attaches the cpu, cpuset, cpuacct, and memory subsystems to it. You can also use shell commands and utilities to create hierarchies and attach subsystems to them. Where subsystems is a comma‑separated list of subsystems and name is the name of the hierarchy. Brief descriptions of all available subsystems are listed in Available Subsystems in Red Hat Enterprise Linux, and Chapter 3, Subsystems and Tunable Parameters provides a detailed reference. the net_cls, ns, cpuacct, devices, freezer, and blkio subsystems are as yet unattached to any hierarchy, as illustrated by the lack of a corresponding mount point. To add a subsystem to an existing hierarchy, detach it from an existing hierarchy, or move it to a different hierarchy, edit the mount section of the /etc/cgconfig.conf file as root, using the same syntax described in Section 2.2, “Creating a Hierarchy and Attaching Subsystems”. When cgconfig next starts, it will reorganize the subsystems according to the hierarchies that you specify. To add an unattached subsystem to an existing hierarchy, remount the hierarchy. Include the extra subsystem in the mount command, together with the remount option. If the hierarchy is currently empty (that is, it contains only the root cgroup) the hierarchy is deactivated when it is unmounted. If the hierarchy contains any other cgroups, the hierarchy remains active in the kernel even though it is no longer mounted. To remove a hierarchy, ensure that all child cgroups are removed before you unmount the hierarchy, or use the cgclear command which can deactivate a hierarchy even when it is not empty — refer to Section 2.12, “Unloading Control Groups”. -t (optional) — specifies a user (by user ID, uid) and a group (by group ID, gid) to own the tasks pseudofile for this cgroup. This user can add tasks to the cgroup. Note that the only way to remove a task from a cgroup is to move it to a different cgroup. To move a task, the user has to have write access to the destination cgroup; write access to the source cgroup is not necessary. -a (optional) — specifies a user (by user ID, uid) and a group (by group ID, gid) to own all pseudofiles other than tasks for this cgroup. This user can modify access of the tasks in this cgroup to system resources. -g — specifies the hierarchy in which the cgroup should be created, as a comma‑separated list of subsystems associated with hierarchies. If the subsystems in this list are in different hierarchies, the group is created in each of these hierarchies. The list of hierarchies is followed by a colon and the path to the child group relative to the hierarchy. Do not include the hierarchy mount point in the path. For example, the cgroup located in the directory /cgroup/cpu_and_mem/lab1/ is called just lab1 — its path is already uniquely determined because there is at most one hierarchy for a given subsystem. Note also that the group is controlled by all the subsystems that exist in the hierarchies in which the cgroup is created, even though these subsystems have not been specified in the cgcreate command — refer to Example 2.5, “cgcreate usage”. Because all cgroups in the same hierarchy have the same controllers, the child group has the same controllers as its parent. The cgcreate command creates two groups named test-subgroup, one in the cpu_and_mem hierarchy and one in the net hierarchy. 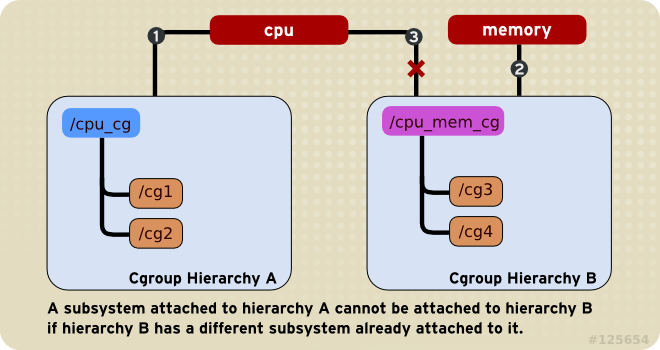 The test-subgroup group in the cpu_and_mem hierarchy is controlled by the memory subsystem, even though it was not specified in the cgcreate command. subsystems is a comma‑separated list of subsystems. path is the path to the cgroup relative to the root of the hierarchy. cgdelete can also recursively remove all subgroups with the option -r.
When you delete a cgroup, all its tasks move to its parent group. parameter is the parameter to be set, which corresponds to the file in the directory of the given cgroup. value is the value for the parameter. cpu_and_mem]# cgset -r cpuacct.usage=0 . Note, however, that / is the preferred syntax. Only a small number of parameters can be set for the root group (such as the cpuacct.usage parameter shown in the examples above). This is because a root group owns all of the existing resources, therefore, it would make no sense to limit all existing processes by defining certain parameters, for example the cpuset.cpu parameter. A trailing slash after the name of the group (for example, cpuacct.usage=0 group1/) is optional. The values that you can set with cgset might depend on values set higher in a particular hierarchy. For example, if group1 is limited to use only CPU 0 on a system, you cannot set group1/subgroup1 to use CPUs 0 and 1, or to use only CPU 1.
path_to_source_cgroup is the path to the cgroup whose parameters are to be copied, relative to the root group of the hierarchy. path_to_target_cgroup is the path to the destination cgroup, relative to the root group of the hierarchy. Ensure that any mandatory parameters for the various subsystems are set before you copy parameters from one group to another, or the command will fail. For more information on mandatory parameters, refer to Important. With this value in place, the tasks in this cgroup are restricted to CPUs 0 and 1 on the system. subsystems is a comma‑separated list of subsystems, or * to launch the process in the hierarchies associated with all available subsystems. Note that if cgroups of the same name exist in multiple hierarchies, the -g option moves the processes in each of those groups. Ensure that the cgroup exists within each of the hierarchies whose subsystems you specify here. path_to_cgroup is the path to the cgroup within its hierarchies. pidlist is a space-separated list of process identifier (PIDs). If the -g option is not specified, cgclassify automatically searches the /etc/cgrules.conf file (see Section 2.8.1, “The cgred Service”) and uses the first applicable configuration line. According to this line, cgclassify determines the hierarchies and cgroups to move the process under. Note that for the move to be successful, the destination hierarchies must exist. The subsystems specified in /etc/cgrules.conf also have to be properly configured for the corresponding hierarchy in /etc/cgconfig.conf. You can also add the --sticky option before the pid to keep any child processes in the same cgroup. If you do not set this option and the cgred service is running, child processes are allocated to cgroups based on the settings found in /etc/cgrules.conf. However, the parent process remains in the cgroup in which it was first started. Note that the PIDs to be moved are separated by spaces and that the specified groups should be in different hierarchies. Replace user with a user name or a group name prefixed with the "@" character. Replace subsystems with a comma‑separated list of subsystem names, control_group represents a path to the cgroup, and command stands for a process name or a full command path of a process. The entry now specifies that when the user named maria uses the ftp command, the process is automatically moved to the /usergroup/staff/ftp cgroup in the hierarchy that contains the devices subsystem. Note, however, that the daemon moves the process to the cgroup only after the appropriate condition is fulfilled. Therefore, the ftp process might run for a short time in the wrong group. Furthermore, if the process quickly spawns children while in the wrong group, these children might not be moved. @ — indicates a group instead of an individual user. For example, @admins are all users in the admins group. * — represents "all". For example, * in the subsystem field represents all mounted subsystems. % — represents an item that is the same as the item on the line above. The above configuration ensures that processes owned by the adminstaff and labstaff access the devices subsystem according to the limits set in the admingroup cgroup. Rules specified in /etc/cgrules.conf can be linked to templates configured either in the /etc/cgconfig.conf file or in configuration files stored in the /etc/cgconfig.d/ directory, allowing for flexible cgroup assignment and creation. The %g and %u variables used above are automatically replaced with group and user name depending on the owner of the ftp process. If the process belongs to peter from the adminstaff group, the above path is translated to users/adminstaff/peter. The cgred service then searches for this directory, and if it does not exist, cgred creates it and assigns the process to users/adminstaff/peter/tasks. Note that template rules apply only to definitions of templates in configuration files, so even if "group users/adminstaff/peter" was defined in /etc/cgconfig.conf, it would be ignored in favor of "template users/%g/%u". %u — is replaced with the name of the user who owns the current process. If name resolution fails, UID is used instead. %U — is replaced with the UID of the specified user who owns the current process. %g — is replaced with the name of the user group that owns the current process, or with the GID if name resolution fails. %G — is replaced with the GID of the cgroup that owns the current process. %p — is replaced with the name of the current process. PID is used in case of name resolution failure. %P — is replaced with the PID of the current processes. Some subsystems have mandatory parameters that must be set before you can move a task into a cgroup which uses any of those subsystems. For example, before you move a task into a cgroup which uses the cpuset subsystem, the cpuset.cpus and cpuset.mems parameters must be defined for that cgroup. The examples in this section illustrate the correct syntax for the command, but only work on systems on which the relevant mandatory parameters have been set for any controllers used in the examples. If you have not already configured the relevant controllers, you cannot copy example commands directly from this section and expect them to work on your system. Refer to Chapter 3, Subsystems and Tunable Parameters for a description of which parameters are mandatory for given subsystems. subsystems is a comma‑separated list of subsystems, or * to launch the process in the hierarchies associated with all available subsystems. Note that, as with cgset described in Section 2.7, “Setting Parameters”, if cgroups of the same name exist in multiple hierarchies, the -g option creates processes in each of those groups. Ensure that the cgroup exists within each of the hierarchies whose subsystems you specify here. path_to_cgroup is the path to the cgroup relative to the hierarchy. command is the command to run. arguments are any arguments for the command. You can also add the --sticky option before the command to keep any child processes in the same cgroup. If you do not set this option and the cgred service is running, child processes will be allocated to cgroups based on the settings found in /etc/cgrules.conf. The process itself, however, will remain in the cgroup in which you started it. ~]# sh -c "echo \$$ > /cgroup/cpu_and_mem/group1/tasks && firefox"
If cpuset is mounted to /cgroup/cpu_and_mem/, the above configuration translates to /cgroup/cpu_and_mem/group1. In each subgroup and in the root group, define the cpu.shares configuration option and set it to 1. Any other processes placed in subgroups blue and red result in the 33.33% percent of the CPU assigned to that specific subgroup to be split among the multiple processes in that subgroup. Configuration for the /etc/cgconfig.conf file can be generated from the current cgroup configuration using the cgsnapshot utility. This utility takes a snapshot of the current state of all subsystems and their cgroups and returns their configuration as it would appear in the /etc/cgconfig.conf file. Example 2.6, “Using the cgsnapshot utility” shows an example usage of the cgsnapshot utility. The -s option used in the example above tells cgsnapshot to ignore all warnings in the output file caused by parameters not being defined in the blacklist or whitelist of the cgsnapshot utility. For more information on parameter blacklisting, refer to Section 2.10.1, “Blacklisting Parameters”. For more information on parameter whitelisting, refer to Section 2.10.2, “Whitelisting Parameters”. When using the -f option, note that it overwrites any content in the file you specify. Therefore, it is recommended not to direct the output straight to the /etc/cgconfig.conf file. Specifying the -t option tells cgsnapshot to generate a configuration with parameters from the whitelist only. There are several ways to find and monitor control groups, subsystems, and hierarchies configured on your system. where PID stands for a PID of the inspected process. In the example output above, the hierarchy column lists IDs of the existing hierarchies on the system. Subsystems with the same hierarchy ID are attached to the same hierarchy. The num_cgroup column lists the number of existing cgroups in the hierarchy that uses a particular subsystem. The enabled column reports the value of 1 if a particular subsystem is enabled, or 0 if it is not. where subsystems is a list of the subsystems in which you are interested. Note that the lssubsys -m command returns only the top-level mount point per each hierarchy. displays the values of cpuset.cpus and memory.limit_in_bytes for cgroups group1 and group2. The cgclear command destroys all cgroups in all hierarchies. If you do not have these hierarchies stored in a configuration file, you will not be able to readily reconstruct them. To clear an entire cgroup file system, use the cgclear command. All tasks in the cgroup are reallocated to the root node of the hierarchies, all cgroups are removed, and the file system itself is unmounted from the system, destroying all previously mounted hierarchies. Finally, the directory where the cgroup file system was mounted is removed. Using the mount command to create cgroups (as opposed to creating them using the cgconfig service) results in the creation of an entry in the /etc/mtab file (the mounted file systems table). This change is also reflected in the /proc/mounts file. However, the unloading of cgroups with the cgclear command, along with other cgconfig commands, uses a direct kernel interface which does not reflect its changes into the /etc/mtab file and only writes the new information into the /proc/mounts file. After unloading cgroups with the cgclear command, the unmounted cgroups can still be visible in the /etc/mtab file, and, consequently, displayed when the mount command is executed. Refer to the /proc/mounts file for an accurate listing of all mounted cgroups. Using the eventfd() function, create a file descriptor for event notifications. For more information, refer to the eventfd(2) man page. To monitor the memory.oom_control file, open it using the open() function. For more information, refer to the open(2) man page. and OOM_control_file_descriptor is used to open the respective memory.oom_control file. For more information on writing to a file, refer to the write(1) man page. When the above program is started, it will be notified of any OOM situation in the cgroup it is monitoring. Note that OOM notifications only work in non-root cgroups. For more information on the memory.oom_control tunable parameter, refer to Section 3.7, “memory”. For more information on configuring notifications for OOM control, refer to Example 3.3, “OOM Control and Notifications”. The ultimate documentation for cgroup commands is available on the manual pages provided with the libcgroup package. The section numbers are specified in the list of man pages below. man 1 cgclassify — the cgclassify command is used to move running tasks to one or more cgroups. man 1 cgclear — the cgclear command is used to delete all cgroups in a hierarchy. man 5 cgconfig.conf — cgroups are defined in the cgconfig.conf file. man 8 cgconfigparser — the cgconfigparser command parses the cgconfig.conf file and mounts hierarchies. man 1 cgcreate — the cgcreate command creates new cgroups in hierarchies. man 1 cgdelete — the cgdelete command removes specified cgroups. man 1 cgexec — the cgexec command runs tasks in specified cgroups. man 1 cgget — the cgget command displays cgroup parameters. man 1 cgsnapshot — the cgsnapshot command generates a configuration file from existing subsystems. man 5 cgred.conf — cgred.conf is the configuration file for the cgred service. man 5 cgrules.conf — cgrules.conf contains the rules used for determining when tasks belong to certain cgroups. man 8 cgrulesengd — the cgrulesengd service distributes tasks to cgroups. man 1 cgset — the cgset command sets parameters for a cgroup. man 1 lscgroup — the lscgroup command lists the cgroups in a hierarchy. man 1 lssubsys — the lssubsys command lists the hierarchies containing the specified subsystems. The lssubsys command is one of the utilities provided by the libcgroup package. You have to install libcgroup to use it: refer to Chapter 2, Using Control Groups if you are unable to run lssubsys. The cpu.shares parameter is specified in the /etc/cgsnapshot_blacklist.conf file by default, which would cause it to be omitted in the generated output in Example 2.6, “Using the cgsnapshot utility”. Thus, for the purposes of the example, an empty /etc/cgsnapshot_blacklist.conf file is used. Subsystems are kernel modules that are aware of cgroups. Typically, they are resource controllers that allocate varying levels of system resources to different cgroups. However, subsystems could be programmed for any other interaction with the kernel where the need exists to treat different groups of processes differently. The application programming interface (API) to develop new subsystems is documented in cgroups.txt in the kernel documentation, installed on your system at /usr/share/doc/kernel-doc-kernel-version/Documentation/cgroups/ (provided by the kernel-doc package). The latest version of the cgroups documentation is also available online at http://www.kernel.org/doc/Documentation/cgroup-v1/cgroups.txt. Note, however, that the features in the latest documentation might not match those available in the kernel installed on your system. the value 0,2 is written to the cpuset.cpus pseudofile and therefore limits any tasks whose PIDs are listed in /cgroup/cpuset/webserver/tasks to use only CPU 0 and CPU 2 on the system. The Block I/O (blkio) subsystem controls and monitors access to I/O on block devices by tasks in cgroups. Writing values to some of these pseudofiles limits access or bandwidth, and reading values from some of these pseudofiles provides information on I/O operations. Currently, the Block I/O subsystem does not work for buffered write operations. It is primarily targeted at direct I/O, although it works for buffered read operations. In the Linux Allocated Devices notation, 8:0 represents /dev/sda. reports the number of I/O operations performed on specific devices by a cgroup as seen by the throttling policy. Entries have four fields: major, minor, operation, and number. Major and minor are device types and node numbers specified in Linux Allocated Devices, operation represents the type of operation (read, write, sync, or async) and number represents the number of operations. reports the number of bytes transferred to or from specific devices by a cgroup. The only difference between blkio.io_service_bytes and blkio.throttle.io_service_bytes is that the former is not updated when the CFQ scheduler is operating on a request queue. Entries have four fields: major, minor, operation, and bytes. Major and minor are device types and node numbers specified in Linux Allocated Devices, operation represents the type of operation (read, write, sync, or async) and bytes is the number of transferred bytes. The following parameters may be used for either of the policies listed in Section 3.1, “blkio”. resets the statistics recorded in the other pseudofiles. Write an integer to this file to reset the statistics for this cgroup. reports the time that a cgroup had I/O access to specific devices. Entries have three fields: major, minor, and time. Major and minor are device types and node numbers specified in Linux Allocated Devices, and time is the length of time in milliseconds (ms). reports the number of sectors transferred to or from specific devices by a cgroup. Entries have three fields: major, minor, and sectors. Major and minor are device types and node numbers specified in Linux Allocated Devices, and sectors is the number of disk sectors. reports the average queue size for I/O operations by a cgroup, over the entire length of time of the group's existence. The queue size is sampled every time a queue for this cgroup receives a timeslice. Note that this report is available only if CONFIG_DEBUG_BLK_CGROUP=y is set on the system. reports the total time (in nanoseconds — ns) a cgroup spent waiting for a timeslice for one of its queues. The report is updated every time a queue for this cgroup gets a timeslice, so if you read this pseudofile while the cgroup is waiting for a timeslice, the report will not contain time spent waiting for the operation currently queued. Note that this report is available only if CONFIG_DEBUG_BLK_CGROUP=y is set on the system. reports the total time (in nanoseconds — ns) a cgroup spent without any pending requests. The report is updated every time a queue for this cgroup has a pending request, so if you read this pseudofile while the cgroup has no pending requests, the report will not contain time spent in the current empty state. Note that this report is available only if CONFIG_DEBUG_BLK_CGROUP=y is set on the system. reports the total time (in nanoseconds — ns) the scheduler spent idling for a cgroup in anticipation of a better request than the requests already in other queues or from other groups. The report is updated every time the group is no longer idling, so if you read this pseudofile while the cgroup is idling, the report will not contain time spent in the current idling state. Note that this report is available only if CONFIG_DEBUG_BLK_CGROUP=y is set on the system. reports the number of times requests for I/O operations by a cgroup were dequeued by specific devices. Entries have three fields: major, minor, and number. Major and minor are device types and node numbers specified in Linux Allocated Devices, and number is the number of times requests by the group were dequeued. Note that this report is available only if CONFIG_DEBUG_BLK_CGROUP=y is set on the system. reports the number of I/O operations performed on specific devices by a cgroup as seen by the CFQ scheduler. Entries have four fields: major, minor, operation, and number. Major and minor are device types and node numbers specified in Linux Allocated Devices, operation represents the type of operation (read, write, sync, or async) and number represents the number of operations. reports the number of bytes transferred to or from specific devices by a cgroup as seen by the CFQ scheduler. Entries have four fields: major, minor, operation, and bytes. Major and minor are device types and node numbers specified in Linux Allocated Devices, operation represents the type of operation (read, write, sync, or async) and bytes is the number of transferred bytes. reports the total time between request dispatch and request completion for I/O operations on specific devices by a cgroup as seen by the CFQ scheduler. Entries have four fields: major, minor, operation, and time. Major and minor are device types and node numbers specified in Linux Allocated Devices, operation represents the type of operation (read, write, sync, or async) and time is the length of time in nanoseconds (ns). The time is reported in nanoseconds rather than a larger unit so that this report is meaningful even for solid-state devices. the time reported can be greater than the total time elapsed, because the time reported is the cumulative total of all I/O operations for the cgroup rather than the time that the cgroup itself spent waiting for I/O operations. To find the time that the group as a whole has spent waiting, use the blkio.group_wait_time parameter. if the device has a queue_depth > 1, the time reported only includes the time until the request is dispatched to the device, not any time spent waiting for service while the device reorders requests. Entries have four fields: major, minor, operation, and time. Major and minor are device types and node numbers specified in Linux Allocated Devices, operation represents the type of operation (read, write, sync, or async) and time is the length of time in nanoseconds (ns). The time is reported in nanoseconds rather than a larger unit so that this report is meaningful even for solid-state devices. reports the number of BIOS requests merged into requests for I/O operations by a cgroup. Entries have two fields: number and operation. Number is the number of requests, and operation represents the type of operation (read, write, sync, or async). reports the number of requests queued for I/O operations by a cgroup. Entries have two fields: number and operation. Number is the number of requests, and operation represents the type of operation (read, write, sync, or async). Refer to Example 3.1, “blkio proportional weight division” for a simple test of running two dd threads in two different cgroups with various blkio.weight values. The above commands create two files (file_1 and file_2) of size 4 GB. Both commands will output their completion time once they have finished. where <disk_device> stands for the name of the desired device, for example sda. The RT scheduler works in a similar way to the ceiling enforcement control of the CFS (for more information, refer to Section 3.2.1, “CFS Tunable Parameters”) but limits CPU access to real-time tasks only. The amount of time for which real-time task can access the CPU is decided by allocating a run time and a period for each cgroup. All tasks in a cgroup are then allowed to access the CPU for the defined period of time for one run time (for example, tasks in a cgroup can be allowed to run 0.1 seconds in every 1 second). Please note that the following parameters take into account all available logical CPUs, therefore the access times specified with these parameters are in fact multiplied by the number of CPUs. applicable to real-time scheduling tasks only, this parameter specifies a period of time in microseconds (µs, represented here as "us") for how regularly a cgroup's access to CPU resources is reallocated. applicable to real-time scheduling tasks only, this parameter specifies a period of time in microseconds (µs, represented here as "us") for the longest continuous period in which the tasks in a cgroup have access to CPU resources. Establishing this limit prevents tasks in one cgroup from monopolizing CPU time. As mentioned above, the access times are multiplied by the number of logical CPUs. For example, setting cpu.rt_runtime_us to 200000 and cpu.rt_period_us to 1000000 translates to the task being able to access a single CPU for 0.4 seconds out of every 1 second on systems with two CPUs (0.2 x 2), or 0.8 seconds on systems with four CPUs (0.2 x 4). reports the total CPU time (in nanoseconds) consumed by all tasks in this cgroup (including tasks lower in the hierarchy). The above command also resets values in cpuacct.usage_percpu. user — CPU time consumed by tasks in user mode. system — CPU time consumed by tasks in system (kernel) mode. CPU time is reported in the units defined by the USER_HZ variable. reports the CPU time (in nanoseconds) consumed on each CPU by all tasks in this cgroup (including tasks lower in the hierarchy). represents CPUs 0, 1, 2, and 16.
represents memory nodes 0, 1, 2, and 16.
contains a flag (0 or 1) that specifies whether a page in memory should migrate to a new node if the values in cpuset.mems change. By default, memory migration is disabled (0) and pages stay on the node to which they were originally allocated, even if the node is no longer among the nodes specified in cpuset.mems. If enabled (1), the system migrates pages to memory nodes within the new parameters specified by cpuset.mems, maintaining their relative placement if possible — for example, pages on the second node on the list originally specified by cpuset.mems are allocated to the second node on the new list specified by cpuset.mems, if the place is available. contains a flag (0 or 1) that specifies whether cpusets other than this one and its parents and children can share the CPUs specified for this cpuset. By default (0), CPUs are not allocated exclusively to one cpuset. contains a flag (0 or 1) that specifies whether other cpusets can share the memory nodes specified for the cpuset. By default (0), memory nodes are not allocated exclusively to one cpuset. Reserving memory nodes for the exclusive use of a cpuset (1) is functionally the same as enabling a memory hardwall with the cpuset.mem_hardwall parameter. contains a flag (0 or 1) that specifies whether kernel allocations of memory page and buffer data should be restricted to the memory nodes specified for the cpuset. By default (0), page and buffer data is shared across processes belonging to multiple users. With a hardwall enabled (1), each tasks' user allocation can be kept separate. a read-only file that contains a running average of the memory pressure created by the processes in the cpuset. The value in this pseudofile is automatically updated when cpuset.memory_pressure_enabled is enabled, otherwise, the pseudofile contains the value 0.
contains a flag (0 or 1) that specifies whether the system should compute the memory pressure created by the processes in the cgroup. Computed values are output to cpuset.memory_pressure and represent the rate at which processes attempt to free in-use memory, reported as an integer value of attempts to reclaim memory per second, multiplied by 1000.
contains a flag (0 or 1) that specifies whether file system buffers should be spread evenly across the memory nodes allocated to the cpuset. By default (0), no attempt is made to spread memory pages for these buffers evenly, and buffers are placed on the same node on which the process that created them is running. contains a flag (0 or 1) that specifies whether kernel slab caches for file input/output operations should be spread evenly across the cpuset. By default (0), no attempt is made to spread kernel slab caches evenly, and slab caches are placed on the same node on which the process that created them is running. contains a flag (0 or 1) that specifies whether the kernel will balance loads across the CPUs in the cpuset. By default (1), the kernel balances loads by moving processes from overloaded CPUs to less heavily used CPUs. Note, however, that setting this flag in a cgroup has no effect if load balancing is enabled in any parent cgroup, as load balancing is already being carried out at a higher level. Therefore, to disable load balancing in a cgroup, disable load balancing also in each of its parents in the hierarchy. In this case, you should also consider whether load balancing should be enabled for any siblings of the cgroup in question. contains an integer between -1 and a small positive value, which represents the width of the range of CPUs across which the kernel should attempt to balance loads. This value is meaningless if cpuset.sched_load_balance is disabled. With the release of Red Hat Enterprise Linux 6.1 the BOOK scheduling domain has been added to the list of supported domain levels. This change affected the meaning of cpuset.sched_relax_domain_level values. Please note that the effect of values from 3 to 5 changed. For example, to get the old effect of value 3, which was "Immediately balance loads across CPUs on the same node or blade" the value 4 needs to be selected. Similarly, the old 4 is now 5, and the old 5 is now 6. The devices subsystem allows or denies access to devices by tasks in a cgroup. The Device Whitelist (devices) subsystem is considered to be a Technology Preview in Red Hat Enterprise Linux 6. Technology Preview features are currently not supported under Red Hat Enterprise Linux 6 subscription services, might not be functionally complete and are generally not suitable for production use. However, Red Hat includes these features in the operating system as a customer convenience and to increase the features' exposure. You might find these features useful in a non-production environment and are also welcome to provide feedback and functionality suggestions for a Technology Preview feature before it becomes fully supported. specifies devices to which tasks in a cgroup have access. Each entry has four fields: type, major, minor, and access. The values used in the type, major, and minor fields correspond to device types and node numbers specified in Linux Allocated Devices, otherwise known as the Linux Devices List and available from http://www.kernel.org/doc/Documentation/devices.txt. major and minor are device node numbers specified by Linux Allocated Devices. The major and minor numbers are separated by a colon. For example, 8 is the major number that specifies Small Computer System Interface (SCSI) disk drives, and the minor number 1 specifies the first partition on the first SCSI disk drive; therefore 8:1 fully specifies this partition, corresponding to a file system location of /dev/sda1. * can stand for all major or all minor device nodes, for example 9:* (all RAID devices) or *:* (all devices). For example, when access is specified as r, tasks can only read from the specified device, but when access is specified as rw, tasks can read from and write to the device. specifies devices that tasks in a cgroup cannot access. The syntax of entries is identical with devices.allow. reports the devices for which access controls have been set for tasks in this cgroup. The freezer subsystem suspends or resumes tasks in a cgroup. FROZEN — tasks in the cgroup are suspended. FREEZING — the system is in the process of suspending tasks in the cgroup. THAWED — tasks in the cgroup have resumed. Move that process to a cgroup in a hierarchy which has the freezer subsystem attached to it. Freeze that particular cgroup to suspend the process contained in it. It is not possible to move a process into a suspended (frozen) cgroup. Note that while the FROZEN and THAWED values can be written to freezer.state, FREEZING cannot be written, only read. By default, the memory subsystem uses 40 bytes of memory per physical page on x86_64 systems. These resources are consumed even if memory is not used in any hierarchy. If you do not plan to use the memory subsystem, you can disable it to reduce the resource consumption of the kernel. For more information on working with /boot/grub/grub.conf, see the Configuring the GRUB Boot Loader chapter in the Red Hat Enterprise Linux 6 Deployment Guide. At the GRUB boot screen, press any key to enter the GRUB interactive menu. Select Red Hat Enterprise Linux with the version of the kernel that you want to boot and press the a key to modify the kernel parameters. Type cgroup_disable=memory at the end of the line and press Enter to exit GRUB edit mode. With cgroup_disable=memory enabled, memory is not visible as an individually mountable subsystem and it is not automatically mounted when mounting all cgroups in a single hierarchy. Please note that memory is currently the only subsystem that can be effectively disabled with cgroup_disable to save resources. Using this option with other subsystems only disables their usage, but does not cut their resource consumption. However, other subsystems do not consume as much resources as the memory subsystem. Additionally, each of these files other than hierarchical_memory_limit and hierarchical_memsw_limit has a counterpart prefixed total_ that reports not only on the cgroup, but on all its children as well. For example, swap reports the swap usage by a cgroup and total_swap reports the total swap usage by the cgroup and all its child groups. Therefore, active_anon + inactive_anon ≠ rss, because rss does not include tmpfs. reports the total current memory usage by processes in the cgroup (in bytes). reports the sum of current memory usage plus swap space used by processes in the cgroup (in bytes). reports the maximum memory used by processes in the cgroup (in bytes). reports the maximum amount of memory and swap space used by processes in the cgroup (in bytes). You cannot use memory.limit_in_bytes to limit the root cgroup; you can only apply values to groups lower in the hierarchy. Write -1 to memory.limit_in_bytes to remove any existing limits. sets the maximum amount for the sum of memory and swap usage. If no units are specified, the value is interpreted as bytes. However, it is possible to use suffixes to represent larger units — k or K for kilobytes, m or M for megabytes, and g or G for gigabytes. You cannot use memory.memsw.limit_in_bytes to limit the root cgroup; you can only apply values to groups lower in the hierarchy. Write -1 to memory.memsw.limit_in_bytes to remove any existing limits. It is important to set the memory.limit_in_bytes parameter before setting the memory.memsw.limit_in_bytes parameter: attempting to do so in the reverse order results in an error. This is because memory.memsw.limit_in_bytes becomes available only after all memory limitations (previously set in memory.limit_in_bytes) are exhausted. Consider the following example: setting memory.limit_in_bytes = 2G and memory.memsw.limit_in_bytes = 4G for a certain cgroup will allow processes in that cgroup to allocate 2 GB of memory and, once exhausted, allocate another 2 GB of swap only. The memory.memsw.limit_in_bytes parameter represents the sum of memory and swap. Processes in a cgroup that does not have the memory.memsw.limit_in_bytes parameter set can potentially use up all the available swap (after exhausting the set memory limitation) and trigger an Out Of Memory situation caused by the lack of available swap. reports the number of times that the memory limit has reached the value set in memory.limit_in_bytes. reports the number of times that the memory plus swap space limit has reached the value set in memory.memsw.limit_in_bytes. This parameter accepts the same suffixes as memory.limit_in_bytes to represent units. To have any effect, the soft limit must be set below the hard limit. If lowering the memory usage to the soft limit does not solve the contention, cgroups are pushed back as much as possible to make sure that one control group does not starve the others of memory. Note that soft limits take effect over a long period of time, since they involve reclaiming memory for balancing between memory cgroups. when set to 0, empties memory of all pages used by tasks in the cgroup. This interface can only be used when the cgroup has no tasks. If memory cannot be freed, it is moved to a parent cgroup if possible. Use the memory.force_empty parameter before removing a cgroup to avoid moving out-of-use page caches to its parent cgroup. sets the tendency of the kernel to swap out process memory used by tasks in this cgroup instead of reclaiming pages from the page cache. This is the same tendency, calculated the same way, as set in /proc/sys/vm/swappiness for the system as a whole. The default value is 60. Values lower than 60 decrease the kernel's tendency to swap out process memory, values greater than 60 increase the kernel's tendency to swap out process memory, and values greater than 100 permit the kernel to swap out pages that are part of the address space of the processes in this cgroup. Note that a value of 0 does not prevent process memory being swapped out; swap out might still happen when there is a shortage of system memory because the global virtual memory management logic does not read the cgroup value. To lock pages completely, use mlock() instead of cgroups. the root cgroup, which uses the swappiness set in /proc/sys/vm/swappiness. a cgroup that has child groups below it. allows moving charges associated with a task along with task migration. Charging is a way of giving a penalty to cgroups which access shared pages too often. These penalties, also called charges, are by default not moved when a task migrates from one cgroup to another. The pages allocated from the original cgroup still remain charged to it; the charge is dropped when the page is freed or reclaimed. Charges are moved only when the moved task is a leader of a thread group. If there is not enough memory for the task in the destination cgroup, an attempt to reclaim memory is performed. If the reclaim is not successful, the task migration is aborted. 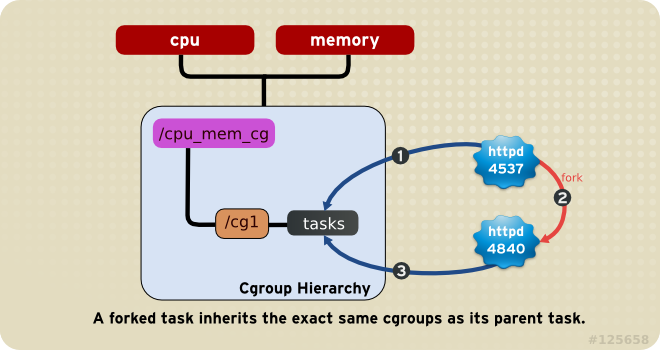 contains a flag (0 or 1) that specifies whether memory usage should be accounted for throughout a hierarchy of cgroups. If enabled (1), the memory subsystem reclaims memory from the children of and process that exceeds its memory limit. By default (0), the subsystem does not reclaim memory from a task's children. When the OOM killer is disabled, tasks that attempt to use more memory than they are allowed are paused until additional memory is freed. The memory.oom_control file also reports the OOM status of the current cgroup under the under_oom entry. If the cgroup is out of memory and tasks in it are paused, the under_oom entry reports the value 1. The memory.oom_control file is capable of reporting an occurrence of an OOM situation using the notification API. For more information, refer to Section 2.13, “Using the Notification API” and Example 3.3, “OOM Control and Notifications”. Reenabling the OOM killer immediately kills the test program. The above program detects OOM situations in a cgroup specified as an argument on the command line and reports them using the mem_cgroup oom event received string to the standard output. The net_cls subsystem tags network packets with a class identifier (classid) that allows the Linux traffic controller (tc) to identify packets originating from a particular cgroup. The traffic controller can be configured to assign different priorities to packets from different cgroups. net_cls.classid contains a single value that indicates a traffic control handle. The value of classid read from the net_cls.classid file is presented in the decimal format while the value to be written to the file is expected in the hexadecimal format. For example, 0x100001 represents the handle conventionally written as 10:1 in the format used by the ip utility. In the net_cls.classid file, it would be represented by the number 1048577. Refer to the man page for tc to learn how to configure the traffic controller to use the handles that the net_cls adds to network packets. The Network Priority (net_prio) subsystem provides a way to dynamically set the priority of network traffic per each network interface for applications within various cgroups. A network's priority is a number assigned to network traffic and used internally by the system and network devices. Network priority is used to differentiate packets that are sent, queued, or dropped. The tc command may be used to set a network's priority (setting the network priority via the tc command is outside the scope of this guide; for more information, refer to the tc man page). Typically, an application sets the priority of its traffic via the SO_PRIORITY socket option. However, applications are often not coded to set the priority value, or the application's traffic is site-specific and does not provide a defined priority. Using the net_prio subsystem in a cgroup allows the administrator to assign a process to a specific cgroup which defines the priority of outgoing traffic on a given network interface. The following tunable parameters are available for the memory subsystem. a read-only file which contains a unique integer value that the kernel uses as an internal representation of this cgroup. The above command forces any traffic originating from processes belonging to the iscsi net_prio cgroup, and with traffic outgoing on the eth0 network interface, to have the priority set to the value of 5. The parent cgroup also has a writable net_prio.ifpriomap file that can be used to set a system default priority. The ns subsystem provides a way to group processes into separate namespaces. Within a particular namespace, processes can interact with each other but are isolated from processes running in other namespaces. These separate namespaces are sometimes referred to as containers when used for operating-system-level virtualization. When the perf_event subsystem is attached to a hierarchy, all cgroups in that hierarchy can be used to group processes and threads which can then be monitored with the perf tool, as opposed to monitoring each process or thread separately or per-CPU. Cgroups which use the perf_event subsystem do not contain any special tunable parameters other than the common parameters listed in Section 3.12, “Common Tunable Parameters”. For additional information on how tasks in a cgroup can be monitored using the perf tool, refer to the Red Hat Enterprise Linux Developer Guide, available from http://access.redhat.com/site/documentation/Red_Hat_Enterprise_Linux/. contains a list of processes, represented by their PIDs, that are running in a cgroup. The list of PIDs is not guaranteed to be ordered or unique (that is, it may contain duplicate entries). Writing a PID into the tasks file of a cgroup moves that process into that cgroup. contains a list of thread groups, represented by their TGIDs, that are running in a cgroup. The list of TGIDs is not guaranteed to be ordered or unique (that is, it may contain duplicate entries). Writing a TGID into the cgroup.procs file of a cgroup moves that thread group into that cgroup. along with the cgroup notification API, allows notifications to be sent about a changing status of a cgroup. contains a Boolean value, 1 or 0, that either enables or disables the execution of the release agent. If the notify_on_release parameter is enabled, the kernel executes the contents of the release_agent file when a cgroup no longer contains any tasks (that is, the cgroup's tasks file contained some PIDs and those PIDs were removed, leaving the file empty). A path to the empty cgroup is provided as an argument to the release agent. The default value of the notify_on_release parameter in the root cgroup is 0. All non-root cgroups inherit the value in notify_on_release from their parent cgroup. contains a command to be executed when a “notify on release” is triggered. Once a cgroup is emptied of all processes, and the notify_on_release flag is enabled, the kernel runs the command in the release_agent file and supplies it with a relative path (relative to the root cgroup) to the emptied cgroup as an argument. The release agent can be used, for example, to automatically remove empty cgroups; for more information, see Example 3.4, “Automatically removing empty cgroups”. Create a shell script that removes empty cpu cgroups, place it in, for example, /usr/local/bin, and make it executable. The $1 variable contains a relative path to the emptied cgroup. All of the following files are located under the /usr/share/doc/kernel-doc-<kernel_version>/Documentation/cgroups/ directory (provided by the kernel-doc package). Source code provided by Red Hat Engineer František Hrbata. This chapter provides application examples that take advantage of the cgroup functionality. Running each instance of a database server inside its own dedicated virtual guest allows you to allocate resources per database based on their priority. Consider the following example: a system is running two database servers inside two KVM guests. One of the databases is a high priority database and the other one a low priority database. When both database servers are run simultaneously, the I/O throughput is decreased to accommodate requests from both databases equally; Figure 4.1, “I/O throughput without resource allocation” indicates this scenario — once the low priority database is started (around time 45), I/O throughput is the same for both database servers. To prioritize the high priority database server, it can be assigned to a cgroup with a high number of reserved I/O operations, whereas the low priority database server can be assigned to a cgroup with a low number of reserved I/O operations. To achieve this, follow the steps in Procedure 4.1, “I/O throughput prioritization”, all of which are performed on the host system. Set a ratio of 10:1 for the high_prio and low_prio cgroups. Processes in those cgroups (that is, processes running the virtual guests that have been added to those cgroups in the previous step) will immediately use only the resources made available to them. In our example, the low priority cgroup permits the low priority database server to use only about 10% of the I/O operations, whereas the high priority cgroup permits the high priority database server to use about 90% of the I/O operations. Figure 4.2, “I/O throughput with resource allocation” illustrates the outcome of limiting the low priority database and prioritizing the high priority database. As soon as the database servers are moved to their appropriate cgroups (around time 75), I/O throughput is divided among both servers with the ratio of 10:1. Alternatively, block device I/O throttling can be used for the low priority database to limit its number of read and write operation. For more information on the blkio subsystem, refer to Section 3.1, “blkio”. When running multiple network-related services on a single server system, it is important to define network priorities between these services. Defining these priorities ensures that packets originating from certain services have a higher priority than packets originating from other services. For example, such priorities are useful when a server system simultaneously functions as an NFS and Samba server. The NFS traffic must be of high priority as users expect high throughput. The Samba traffic can be deprioritized to allow better performance of the NFS server. The net_prio subsystem can be used to set network priorities for processes in cgroups. These priorities are then translated into Type Of Service (TOS) bits and embedded into every packet. Follow the steps in Procedure 4.2, “Setting Network Priorities for File Sharing Services” to configure prioritization of two file sharing services (NFS and Samba). This configuration ensures that nfs service processes are moved to the nfs_high cgroup when the nfs service is started or restarted. For more information about moving service processes to cgroups, refer to Section 2.9.1, “Starting a Service in a Control Group”. Note that this rule moves every smbd daemon, not only /usr/sbin/smbd, into the samba_low cgroup. You can define rules for the nmbd and winbindd daemons to be moved to the samba_low cgroup in a similar way. Network traffic originating from NFS now has higher priority than traffic originating from Samba. Similar to Procedure 4.2, “Setting Network Priorities for File Sharing Services”, the net_prio subsystem can be used to set network priorities for client applications, for example, Firefox. When a large amount of users use a single system, it is practical to provide certain users with more resources than others. Consider the following example: in a hypothetical company, there are three departments — finance, sales, and engineering. Because engineers use the system and its resources for more tasks than the other departments, it is logical that they have more resources available in case all departments are running CPU and memory intensive tasks. For this example to work properly, you must have the libcgroup package installed. Using the /etc/cgconfig.conf and /etc/cgrules.conf files, you can create a hierarchy and a set of rules which determine the amount of resources for each user. To achieve this, follow the steps in Procedure 4.3, “Per-group CPU and memory resource management”. cpu — the cpu.shares parameter determines the share of CPU resources available to each process in all cgroups. Setting the parameter to 250, 250, and 500 in the finance, sales, and engineering cgroups respectively means that processes started in these groups will split the resources with a 1:1:2 ratio. Note that when a single process is running, it consumes as much CPU as necessary no matter which cgroup it is placed in. The CPU limitation only comes into effect when two or more processes compete for CPU resources. cpuacct — the cpuacct.usage="0" parameter is used to reset values stored in the cpuacct.usage and cpuacct.usage_percpu files. These files report total CPU time (in nanoseconds) consumed by all processes in a cgroup. memory — the memory.limit_in_bytes parameter represents the amount of memory that is made available to all processes within a certain cgroup. In our example, processes started in the finance cgroup have 2 GB of memory available, processes in the sales group have 4 GB of memory available, and processes in the engineering group have 8 GB of memory available. The memory.memsw.limit_in_bytes parameter specifies the total amount of memory and swap space processes may use. Should a process in the finance cgroup hit the 2 GB memory limit, it is allowed to use another 1 GB of swap space, thus totaling the configured 3 GB. The above configuration creates rules that assign a specific system group (for example, @finance) the resource controllers it may use (for example, cpu, cpuacct, memory) and a cgroup (for example, finance) which contains all processes originating from that system group. In our example, when the cgrulesengd daemon, started via the service cgred start command, detects a process that is started by a user that belongs to the finance system group (for example, jenn), that process is automatically moved to the /cgroup/cpu_and_mem/finance/tasks file and is subjected to the resource limitations set in the finance cgroup. Note that cgred is the name of the service that starts the cgrulesengd daemon. Because the cgrulesengd daemon moves a process to a cgroup only after the appropriate conditions set by the rules in /etc/cgrules.conf have been fulfilled, that process may be running for a few milliseconds in an incorrect cgroup. An alternative way to move processes to their specified cgroups is to use the pam_cgroup.so PAM module. This module moves processes to available cgroups according to rules defined in the /etc/cgrules.conf file. Follow the steps in Procedure 4.4, “Using a PAM module to move processes to cgroups” to configure the pam_cgroup.so PAM module. Note that the libcgroup-pam package that provides this module is available form the Optional subscription channel. Before subscribing to this channel please see the Scope of Coverage Details. If you decide to install packages from the channel, follow the steps documented in the article called How to access Optional and Supplementary channels, and -devel packages using Red Hat Subscription Manager (RHSM)? on Red Hat Customer Portal. Note that on 32-bit systems, the module is placed in the /lib/security directory. Configure the /etc/cgconfig.conf and /etc/cgrules.conf files as in Procedure 4.3, “Per-group CPU and memory resource management”. Log out all users that are affected by the cgroup settings in the /etc/cgrules.conf file to apply the above configuration. When using the pam_cgroup.so PAM module, you may disable the cgred service. Red Hat Enterprise Linux 6.3 GA release of the Resource Management Guide.